Class of 2020 DP Geography students learning about the economics of the scrap and recycling business at our local scrap dealer. On Monday April 1st the DP1 Geography class visited our local scrap dealer to get a better sense of what happens to school recyclables. 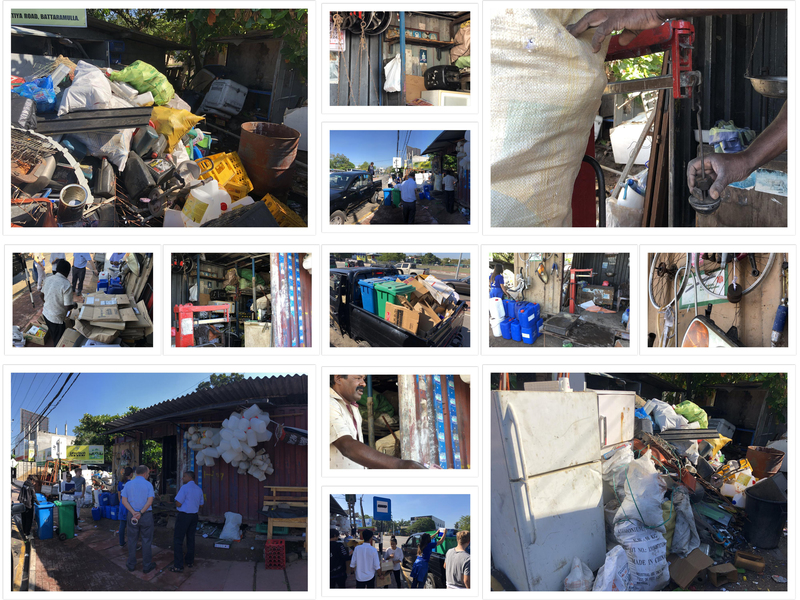 This short field trip followed up a longer two week field investigation into solid waste patterns in the OSC neighborhood (see separate post). The group of eight students took several bags of mixed paper as well as some folded cardboard. 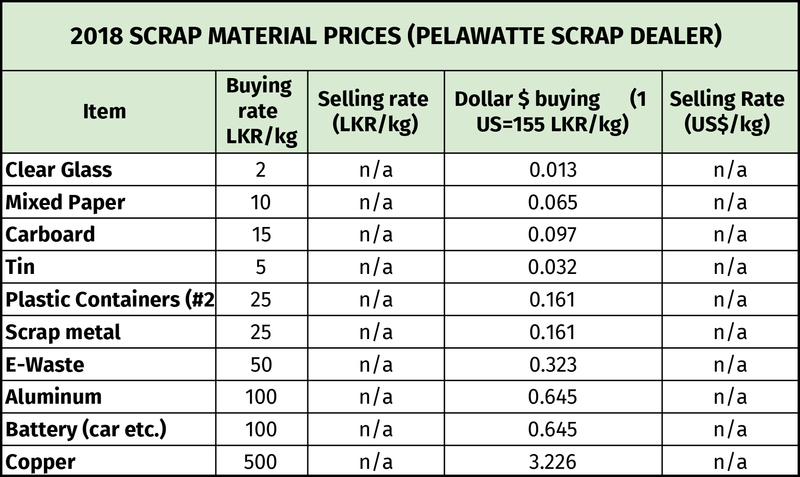 The scrap dealer is based out of an old shipping container on the side of Panipitiya road. Students were able to ask a series of questions and learn more about the economics of recycling from the perspective of this dealer. 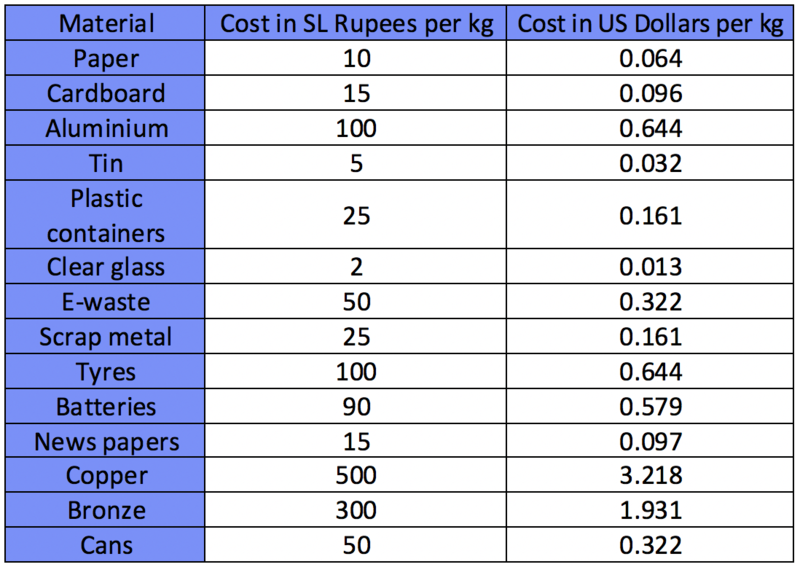 We also sold our mixed paper (12kg) and cardboard (5 kg) for a grand total of 146 LKR. Students also got a chance to speak with Matt Jackson, a patron and OSC community member. 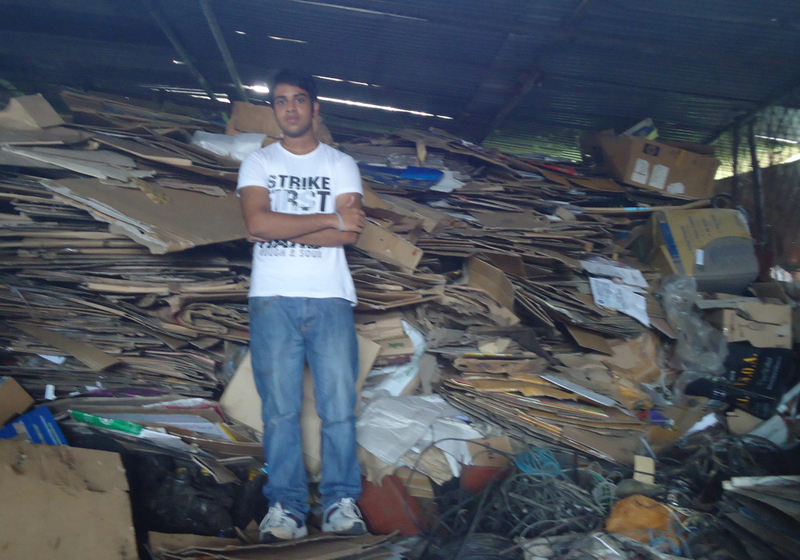 He outlined what he does in terms of collecting and sorting recyclables which are deposited at the dealer. He doe not take any money for his materials. The class has updated the buying (and selling) costs of the materials that our scarp dealer deals with in. Some prices have climbed while others have decreased since we gathered the same data last year. These are purely based on what our dealer is telling us and we know from past studies that we could probably get better prices at other locations. Our goal, however, is to reduce solid waste and not to earn more money. 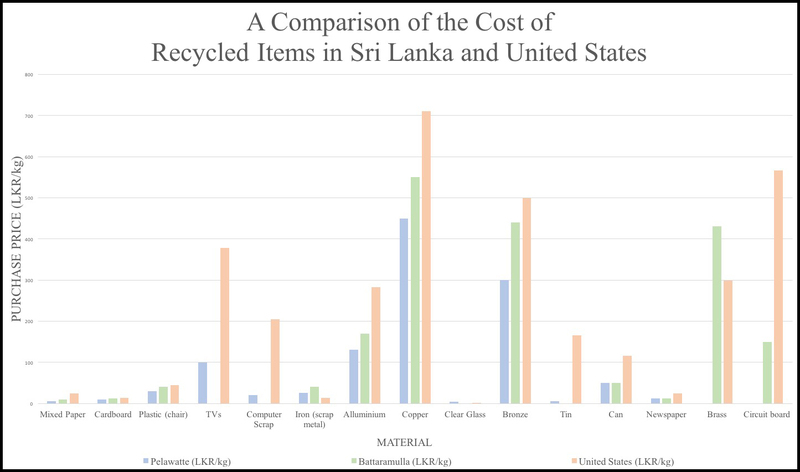 We remain interested in patterns of recyclables and commodity prices. Salman, Malaika and Dominic Harding. 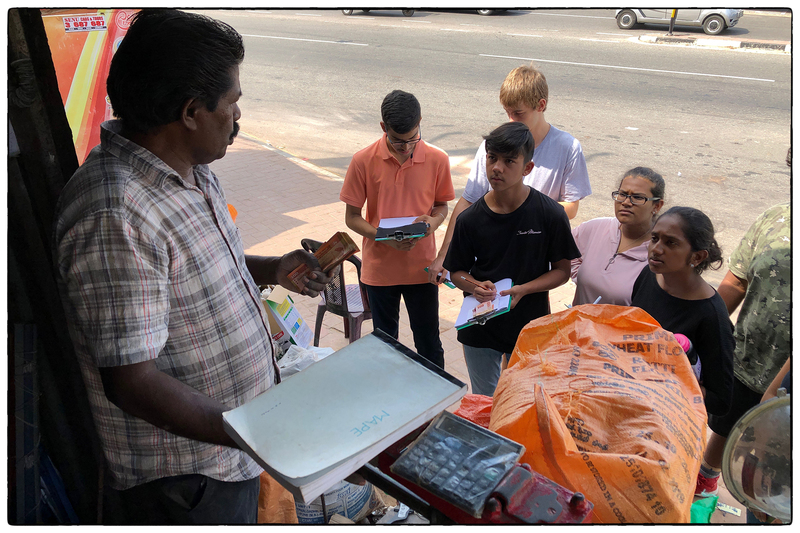 “Recycling Paper in the OSC and Pelawatte community: A 2018 Update.” Recycling & Sustainability Blog. 22 March 2018. Web. 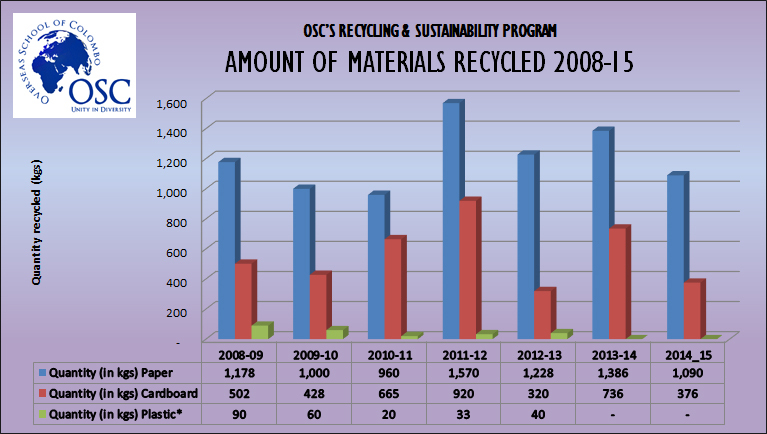 The following graph highlights amounts of paper, cardboard and plastic recycled by OSC’s recycling & sustainability service project. These resources are collected and sorted by students during our Thursday afternoon service block. We then take them in the school pickup to our neighborhood scrap dealer where the paper and cardboard is sold and weighed. We also collect plastic, batteries, cartridges, but we do not get paid significantly for these. Glass and metals are also collected but our numbers are not significant. 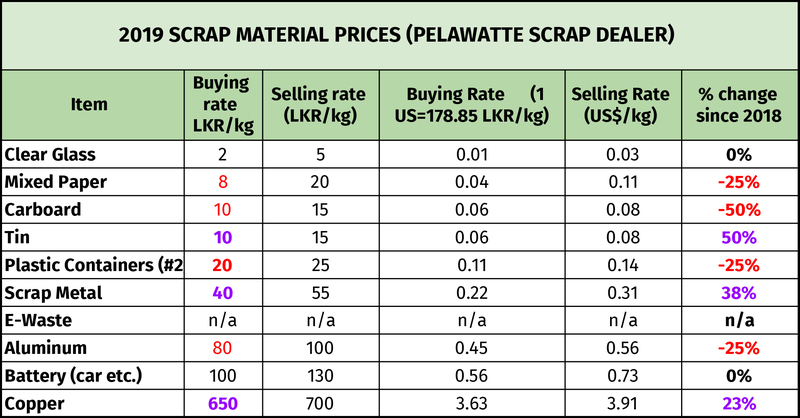 Prices for recycled paper and card board have roughly stayed the same during this period (1kg of card board sells for 10 LKR and 1 kg of mixed paper sells for 5 LKR). While we have been working to recycle more of our school’s waste, we are also concerned about consumption patterns and are working to educate the community about reducing these levels. Nevertheless, there is a general decline in paper being recycled (perhaps due to lower consumption patterns as the school moves to a electronic, 1:1 teaching & learning environment). We worked with the canteen on trying to reduce the usage of disposable containers that are used for snack and lunches. We had initial success with this and consumption of disposable boxes decreased. However, after some time, it jumped back, highlighting several issues. Firstly, what is driving the problem is the dearth of appropriate washable containers and cutlery in the canteen. Secondly, there is wide spread apathy amongst students about using disposable materials. Our student leader Nisala has come up with further proposals to deal with this modeled on his observations and ideas from seeing the way that ASB handles solid waste (including food) in Mumbai. In terms of amounts recycled our data shows that the total volume is going down. At the moment we don’t have exact numbers on how much paper was consumed but my guess is that it is less. This is likely because the school is moving to do much more of its communication electronically. This year, for example, student reports were all given out electronically. The business office has promised to share data on paper consumption that will either support of refute this hypothesis. Students used Managebac to do their service reflections this year. Other than simply talking about what they were doing in the activity we emphasized reflecting on broader learning and trends in solid waste issues in Colombo and beyond. 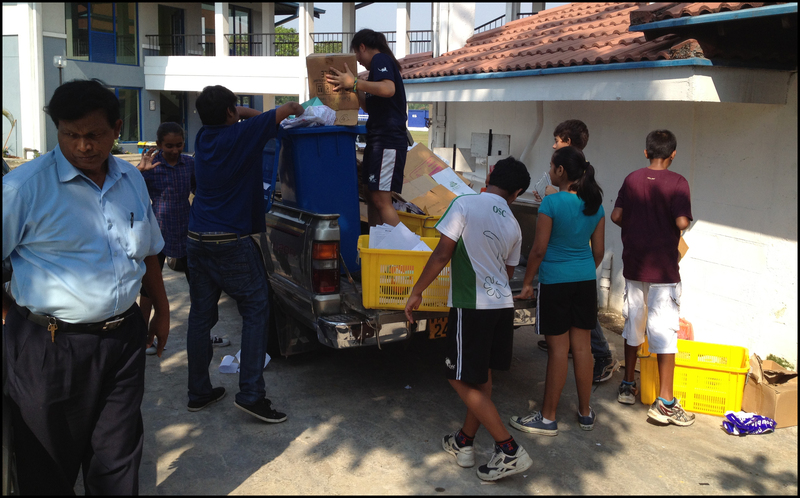 In April several of us accompanied the PYP Grade 5 class on a visit to the large Colombo Municipal waste dump located near Dahampura. 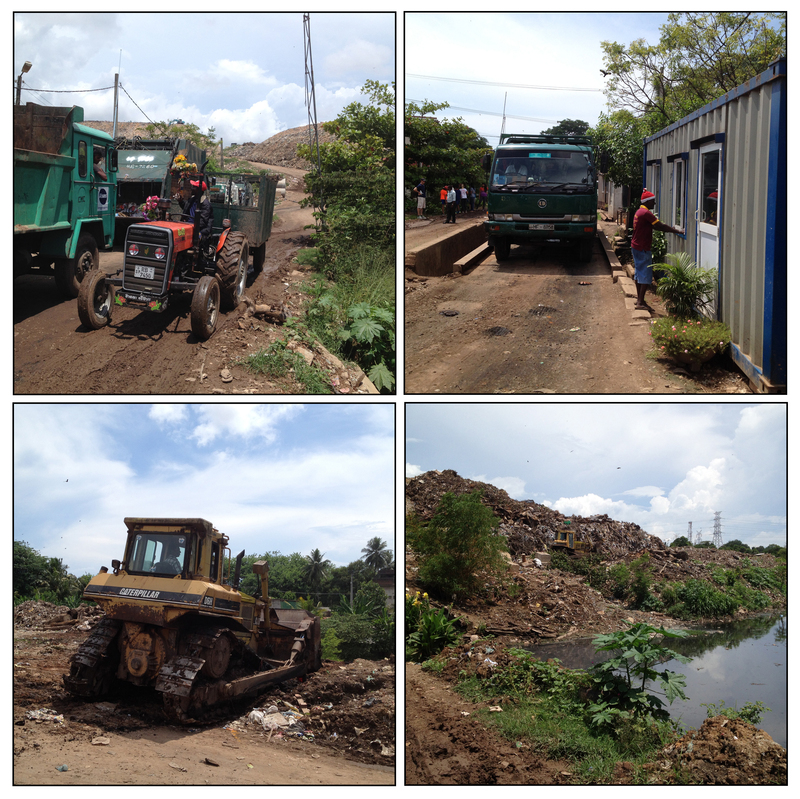 We were able to observe dozens of truck coming into to dump unsegregated solid waste. With the support of a scientist from IWMI the students collected water sample from nearby ponds and ran basic water quality tests on it. They have approached OSC’s administration to get a bio-digester (made by Arpico) to handle our food waste. The R&S service group has committed to supporting this with money raised from paper and cardboard sold over recent years. We close the year with an acknowledgement that there is much, much more to be done. The solid waste crisis seems to get worse here (see news articles below) but we believe that our efforts are beginning to address issues both from a consumption and recycling point of view. “Angry Sirisena blasts officials: Clean up cities, suburbs within a week or go.” Sunday Times. 24 May 2015 Web. Warakapitiya, Kasun. “Garbage rots on roadsides as councils fumble for lasting solutions.” Sunday Times. 24 May 2015 Web. It is the end of the school year and the recycling and sustainability group is helping students and faculty to recycle as much of their left over paper and other materials. It is at times like this that international schools like OSC realize the extraordinary amount of resources that they are consuming! Our service groups’s mission continues to be aimed at both recycling materials and reducing the overall amount consumed. This time also marks a significant transition for us as the seniors, including co-leaders Constanze and Alex as well as super-assistant Jakov, depart for university and beyond. They have been an excellent bunch of students to work with and we will miss them. Meanwhile grade 10 student Tommasso has stepped in to take the leadership reins. He has worked with the group since grade 8 and it is a great loss that he is returning to Italy this summer. We trust that he will continue to work to reduce humanity’s ecological footprint in his new Mediterranean setting! Next year we are looking forward to new leadership from Grade 11 students. Jennifer is joining our group and already showing signs of enlightened and determined leadership. She will be joined by Sahil, Connor, Sanjiv and others. Our backbone remains the energetic MYP students. In an effort to keep track of patterns and trends we have graphed our data from the last four years. 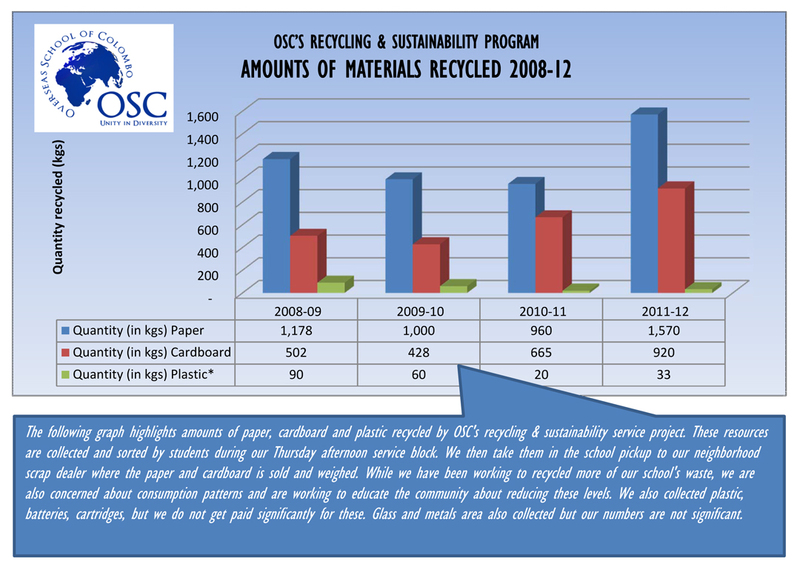 The graph above highlights amounts of paper, cardboard and plastic recycled by OSC’s recycling & sustainability service project. These resources are collected and sorted by students during our Thursday afternoon service block. We then take them in the school pickup to our neighborhood scrap dealer where the paper and cardboard is sold and weighed. While we have been working to recycled more of our school’s waste we are also concerned about consumption patterns and are working to educate the community about reducing these levels. We also collected plastic, batteries, cartridges, but we are paid significantly for these. Glass and metals are also collected but our numbers are not significant.